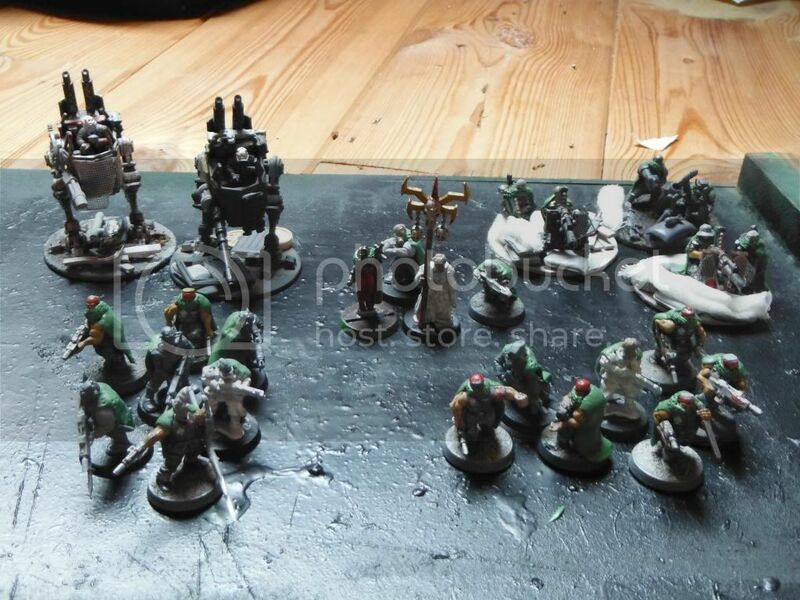 Finally started to rebuild my Imperial Guard army the way I like it: I have thrown out the medium and heavy tanks and regular infantry (soldiers and ogryns). 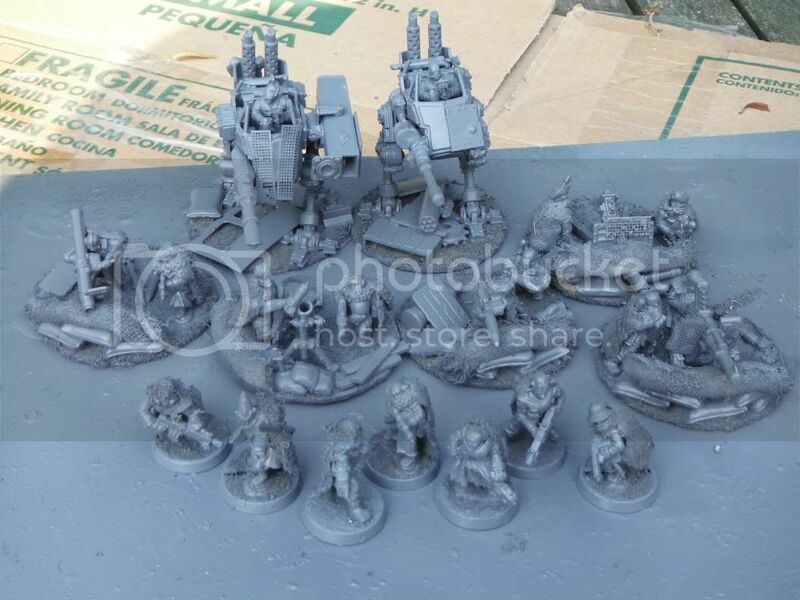 These are actually for sale on: https://www.heresy-online.net/forums/...army-sale.html (minus the veterans and the Exterminator, I have used them for parts. Price to be negotiated!). 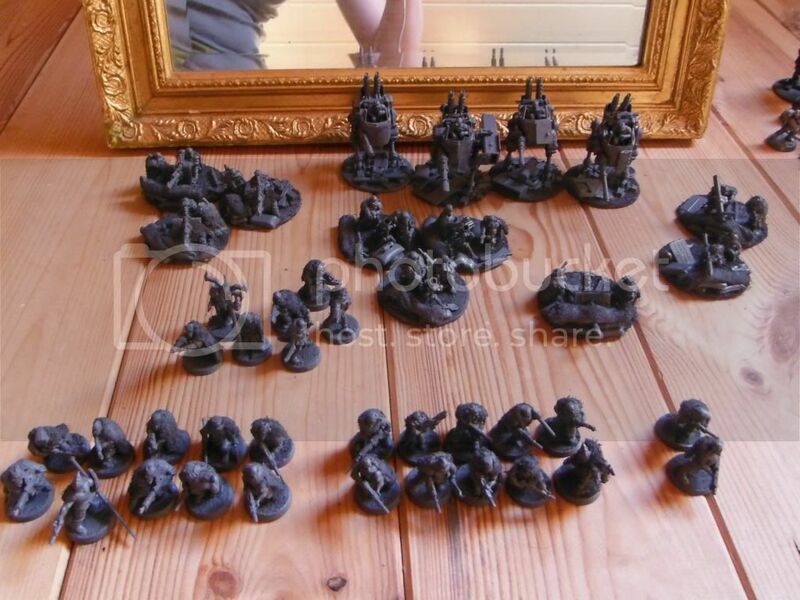 In go a whole lot of models from all over the place to build a irregular light infantry army. 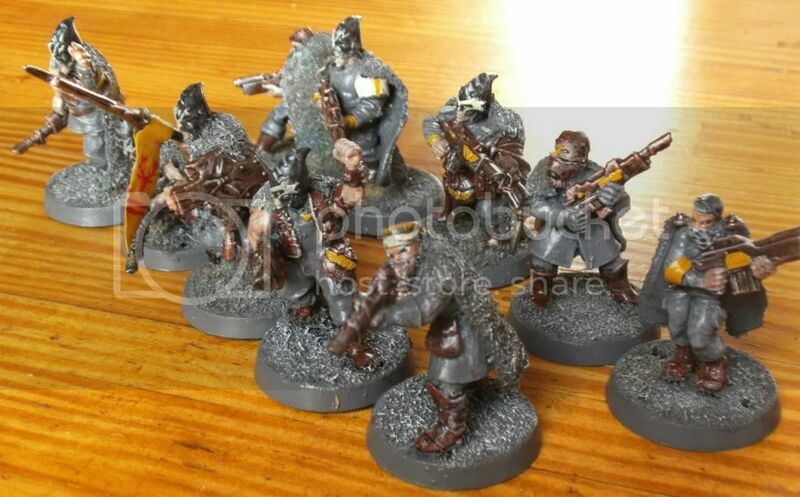 These will depict the ash waste nomads between two major hive cities on Necromunda (whoever knows the Necromunda fluff might remember them) and resemble a crossover between the Fremen from Dune and the survivors of a nuclear holocaust. The actual rules for the Necromunda (skirmish) nomads can be found on: http://files.sigil.biz/data/fo_031_a...tes_nomads.pdf, so I am mirroring these rules. Meaning no flamers and respirators for everybody. 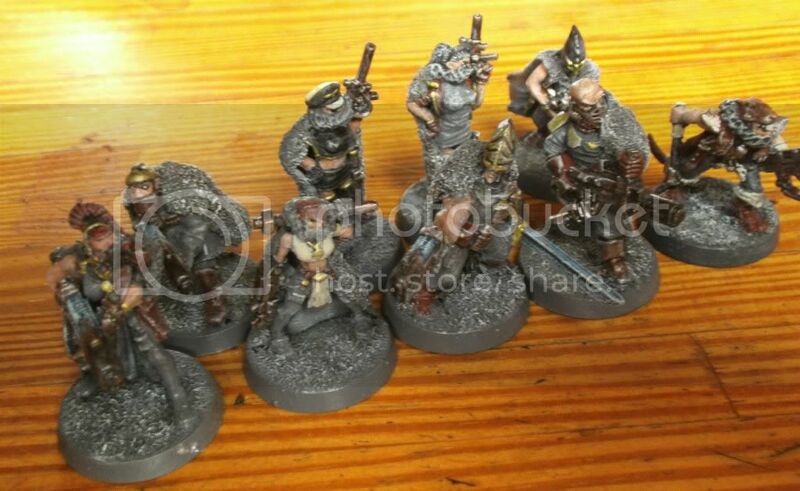 I also give all models a grey coat under which they can take shelter and become nigh invisible in the ash wastes. The only vehicles will be 6 sentinels and 10 rough riders. The first part of this army can be found on my (Dark Eldar forum) page on: Project Log: 'The Nomad Legion', Necromundan IG army. 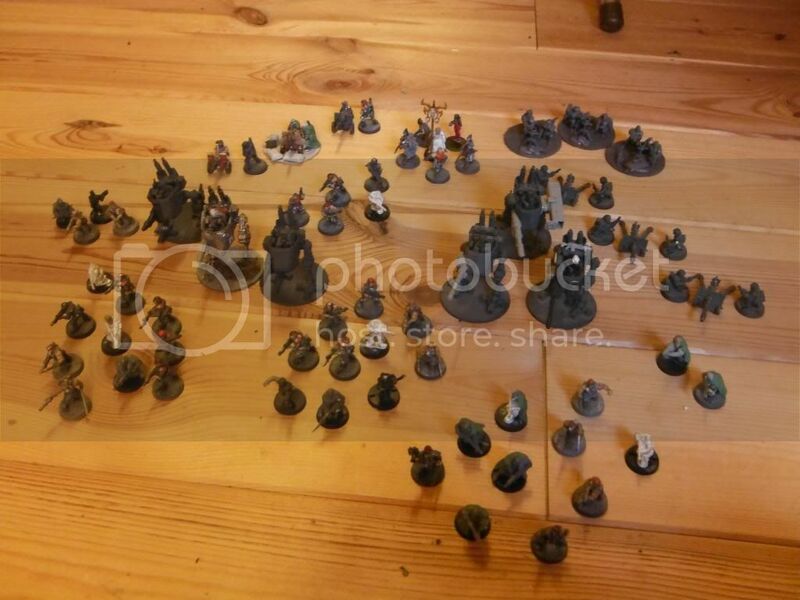 Here (and there) I will add step two: taking a troop choice and turning it into an army. For this, I have gathered models from just about everywhere and have started cutting and pasting and green stuffing. Last edited by Mare; 07-03-13 at 07:52 PM. oooohhhhh I like the looks of this! Nice to see something thing different in the way of IG. Hvae you developed some custom fluff for the force? SUBJECT : General Alexander, count of the Ashgallow Plains, general of the 317th Necromundan Brigade, nicknamed ‘The Nomad Legion’, Necromunda. REPORT : Lord General Alexander was born Nikolas Alexander and the son of the wealthy caravan trader and nobleman Igor Alexander. He was born and raised in the Ashgallow Plains, the ash plains between the Necromundan hives Hive Primus and Hive Secundus. His clear talent for human resources and his inherent charm kept the ash raiders in the sector from attacking his fathers caravans, and business flourished. Soon Alexander led the caravans himself and earning a small fortune out of the dangerous trade. At age 26 however, the Ashgallow Plains burst into open rebellion against governor Helmawr. Reason for this was the inauguration of a new secretary of finances in Hive Primus. Not willing to tax the rich spire nobles, the taxation policy changed to bludgeoning the lower hive inhabitants into becoming serfs. This was done through the extensive use of the Planetary Defense Force. Fighting in the lower hive turned into a smashing defeat for the PDF, since the inhabitants fought with all their might and used the terrain to their advantage. When the gangs amassed to attack the hive spire, a full truce was signed in haste, since the nobles saw their assets threatened. The money had to come from somewhere though, and now policy turned to the ash nomads. The secretary had lost a lot of credit for his actions, and so he played the game in a different fashion : he arranged an inquisitorial crackdown on anti-imperial sentiments in the Ashgallow Plains. Inquisitor Radec, the son of a Necromundan spire noble, was brought into the fray. He was noted to be a fanatic who could make his own mother rebellious and frowned upon even by the Inquisition itself. But he held the title and together with a few armoured divisions he set out to conquer the Ashgallow Plains for the governmental treasure coffers. Even as he met the first ash nomad gang leader, his head was blown off by a nomad’s bolter. The secretary saw his chance for war and convinced the governor that this was an act which was to be punished. The armoured divisions rolled in and destroyed village after village before the ash nomads scattered, promising to turn the grey ash into bloody red mud. Torching every village as they retreated, the nomads lured the army divisions deeper and deeper into the ash plains. Guerilla units then sneaked back behind the tanks and started ambushing supply columns. The army itself could not intercept these lightly armed nomads who just sneaked in and out of sight. Underfed and with a lack of supplies, the hand of the commanding general was forced to accept the battlefield he was being lured to by the nomads. Battle was joined in an area infamous for its ash dunes. Most tanks got stuck in the ash. They were quickly blown up by the nomads, who dug out of the plains where they had been hidden for days. With cheap grade demolition charges, all that was left of the armoured column was reduced to burning rubble in a few hours. The ash nomads society had been burned, but along with it had gone the cream of the Necromundan armoured divisions and also the supply routes between Hive Primus and Hive Secundus, as the nomads had been furious and blind in their destruction of the ‘hivers’. The caravan routes guarded for generations by the Alexander family and others were littered by corpses and burned out trucks, and both hives began to feel a distinct lack of important goods. When the Alexander Trading Company was close to bankruptcy, Nikolas Alexander got his chance for a new life : to quell the rebellion, the governor activated the ancient fuedal system, demanding all his loyal subjects in the Ashgallow Plains to deliver troops for the army. Not having anything to do while sending out a caravan would mean more graves to dig, Alexander gathered his men, put them all on horseback and joined the army. Within a few months, Alexander was noted for his extreme leadership and knowledge of terrain and hit and run tactics. The army command had few other options than to promote the young man to commander as soon as it was clear that the other fiefdom troops listened to his judgement first and to high command second, mostly meaning that the missions were all out successes for Alexander. As the hatred and jealousy of the generals toward the young and talented Alexander grew day by day, Alexanders’ scouting force, which he had dubbed ‘the ash raiders’, drove the nomads into mountainous terrain and cornered their leaders while the nomad warriors surrendered after a pitched night battle. The generals grumpily congratulated Alexander for the all out victory and ordered him to slay all nomads and to put their heads on pikes. In response, Alexander ignored these orders and signed a everlasting peace between the nomads and the Imperium. Not much is known of Alexander in the seven years to follow, as the penal legion commanders do not take much interest in keeping records on the convicts. Seemingly however, Alexander managed to pull off victories at 18 different warzones, while in the end af full 7% of his men stayed alive, a remarkable record for any penal legion unit. He earned the code nickname of ‘Ash Wolf’. In the meantime on Necromunda, things had grown hot. As they had ordered Alexander, the generals had put the heads of all nomad prisoners on spikes. They enforced even more strict measures against the nomads. As rebellion rose even more brutal on both sides, the army generals issued a large reward for every ash nomads head brought in by anyone. The nomads were to cease to exist. The response of nomad nations outside the Ashgallow Plains was as could be predicted : everywhere nomads began assaulting caravans, plundering all weapons they could find, and launching an all out attack on all hives on the planet. Most were repelled by the underhivers, but on Necromunda Prime, the underhivers cleared a path for the nomads. They had not forgotten their fate from ten years earlier. Units from all over the planet, and the penal legionaries from the asteroid belt were rushed to defend the hive spire. A bloody war was fought in seven floors of the hive, with gangers collecting their own bills among other gangs as well. At this point, a lone commissar who had been responsible for law and order among the divisions who had fought ten years long against the nomads, appealed to Helmawr, the governor of Necromunda, who was besieged in the hive spire. His name was Tolstoi. He stated that eventually the nomads could be pushed back, but that the nomads had been too fierce to let them be crushed. They could better serve the Emperor against heretics. He said to the governor that there was only one man in the entire sector who had the stature to end this mess, and that this man served as a penal legionnary 143 floors lower. Within a day, Alexander was declared tempory battle leader of the Necromundan forces in Hive Primus. Immediately, he collected his men, refusing to even listen to the grovelling officers who had once banned him, and then did what has since then adopted by counter insurgency officers all across the galaxy : he released all of his men at once. He told all officers to let them go. And then he ordered a week of complete cease fire. Four days later, a delegation of hive and nomad gang leader stood in the battlefield, waving a white flag. They were willing to forget all what had happened the last ten years and retreat to their own grounds if the secretary could be handed over to them. The governor, who had been monitoring the battlefield for the complete cease fire period, accepted to the terms. Within an hour, life in the lowerhive had resumed as normal, and all that was left was a torched dozen of floors. Commissar Tolstoi captured some of the ex-penal legion troopers to find out what had happened, and realised after the interrogation that releasing the prisoners was an act of strategic brilliance : they had returned to their families and told their story. As fast as mouths can speak, the whole underhive and the gangers had refused to wage war on the only man who had been willing to accept their honourable defeat and let them keep their f dignity and independence. With one stroke, the war had ended. Not a single bolt had been fired. The commissariat and the army leaders had a problem now : what to do with the war hero ? Send him back to the penal legion ? They would cheer him like a returned liberator. Execute him ? The gangs and nomads would forget their promises and stop at nothing to kill every spirer. Leave him army command ? Out of the question, this man was too dangerous already. A workable compromise was struck : Alexander would be allowed to raise a single brigade as he saw fit, which would then be added to the Necromundan Expeditionary Forces (NECEF) to fight in every war zone. If he was killed, so much the better, if not, it would only reflect on the blazon of Necromundan leadership. Besides, it would kill a lot of heretics. Since then, Alexanders ‘Nomad Legion’ has fought continuously for almost twenty years. Years ago, a not-too-wise Imperial secretary decided to bludgeon the Ashgallow Nomads into debt slavery. The Ashgallow Plains are the area between Hive Primus and Hive Secundus on Necromunda, and as such widely used for trade. Regular raids on caravans had made the nomads into hated savages for many influential guilders and Spire nobles, so the target seemed logical - even while the used tactics were ineffective. In the following conflict, eventually the Ashgallow nomad villages were burned down after their inhabitants had fled. Seemingly, this could be considered as a victory for the Necromundan Steel Legions leading the attack, if it weren't for the constant counter attacks by guerrilla nomads using both the terrain and self-constructed meltabombs to burst the tanks open at every opportunity. Eventually, a full elite Necromundan armoured division was lost in this conflict. The gains? A never ending waste only holding any value for dedicated prospectors who cost just about as much as they would ever hope to scavenge. So finally brigadier general Alexander, whose involvement had been crucial in bringing the Hive Primus Emperor's Day Uprising to a hold, was ordered to sign an everlasting peace with the nomads. - the Ashgallow nomads would be excempt from Imperial taxation in exchange for a regular tithe of able men and women to serve under their own officers in the newly formed NECEF-317th 'Nomad Legion' Brigade, under the command of brigadier general Alexander himself. - all raids on caravans between Hive Primus and Hive Secundus had to stop. - the nomads had to support Imperial agents, such as priests and commissars, and had to accept the Cult of the Emperor as a primary creed, under the provision that their 'God of Ashes' would be condoned and that every Imperial agent had to be approved by the nomad Council of Elders. If an agent was not approved because of unrespectful methods used, that would only mean a new agent was selected and presented. Refusing the acceptance of Imperial agents would make the armistice moot and invalid. As it happened, both points I and III were relative successes: the nomads thrived in the following years, even as their sons and daughters fought for Necromunda across the galaxy. Regular contact between Imperial agents and the nomads meant that lucrative trade and new ideas and technology became within reach. Some nomads even enlisted in governmental schools. Point II, on the end of raids on caravans, however, was a blatant failure. While people starve, they don't tend to care much about the personal property of another. Raiding caravans remained a constant source of both nomad income and internal strive among the tribes. Whole peoples shattered under pressure from within, with sons taking up the piratical trade their fathers had forbidden, and gangs of youth scattering in all directions to look for guilder caravans to plunder. Since untold centuries, the wastes around the Necromunda hives had been very similar to underhive clan structures: anarchic, lawless and ever changing, just as the waste dunes themselves. Rival gangs of nomads had fought against each other just as much as they had fought against guilder caravans crossing the ashes, only sporadically banding together under the leadership of charismatic clan leaders or to defend against outward agression. Even after the Ashgallow Armistice, ancient rivalries between different villages and tribes had continued unabated. Erstwhile, Imperial justice had been minimal in the wastes, as the presence of their agents had been marginal at best. Little point in organising some sort of law and order, if the agents enacting these laws were ambushed and killed almost on sight by furiously territorial and independent nomad tribes. Only a few elements of Adeptus Arbites and companies of bounty hunters paid by hive guilders patrolled the wastes, playing a cat-and-mouse game with the nomads to eliminate the more talented or infamous figures, and thus, keep the clans divided to limit their threat to Imperial assets. Even after the Ashgallows Armistice had been signed, and ambitious or unlucky nomads signed up in the Nomad Legion to fight for their God of Ashes, the Emperor and the continued independence of their tribes, the diverse clans remained hopelessly divided amonst themselves. And then appeared the mysterious figure now known as 'The Wanderer'. Little is known about this enigma, although rumours abound. Some say he is a commissar appreciating the freedom of initiative in the Wastes above the strict hierarchy within his order. Others say that he is a banished bounty hunter with ulterior motives, a Hive noble or a guilder our for power. The only thing that is known, is that he appeared in the camp of the nomad clan leader now known as 'the Cardinal of Ashes' and offered him a power sword of enormous value and an undeterminable age, and helped him to band multiple clans together under his rule, in a short campaign of diplomacy, warfare, bullying and outright assassination of rival warlords. Even though today the nomad clans remain splintered as a whole, 'The Wanderer' managed to help bind many tribes under the charismatic leadership of 'The Cardinal' to the Imperium in a loose pact of mutual protection and uneasy respect. With the help of the newly commissioned Necromundan PDF forces protecting the primary road between Hive Primus and Hive Secundus, the Cardinal has carved out a strong power base and has eliminated or subdued even more rival tribes opposing his command. And now, hive guilders and PDF commanders alike consider the joint tribes under the Wanderer and the Cardinal as to be their primary source of trust and security in the wastes - limited and unreliable as it is. For the first time since anybody cares to remember, a confederacy of nomad tribes in the Ashgallow Plains is starting to grow prosperous and powerful and is condoned as such most of the time by the Imperium. No longer do the Necromundan steel legions need to fight against the combined anger of the tribes - they can just leave the main bulk of the fighting to the nomads under the Cardinal. A matter which suits governor Helmawr, the guilders, the PDF and the commissariat just fine. It only remains to be seen what would be the end of the ambition of both the Wanderer and the Cardinal: are they truly as loyal as they seem to be? Are they actually satisfied to rule over wastes of ash dunes and garbage piles, or does their ambition reach beyond controlling these poor assets? Last edited by Mare; 07-03-13 at 08:09 PM. 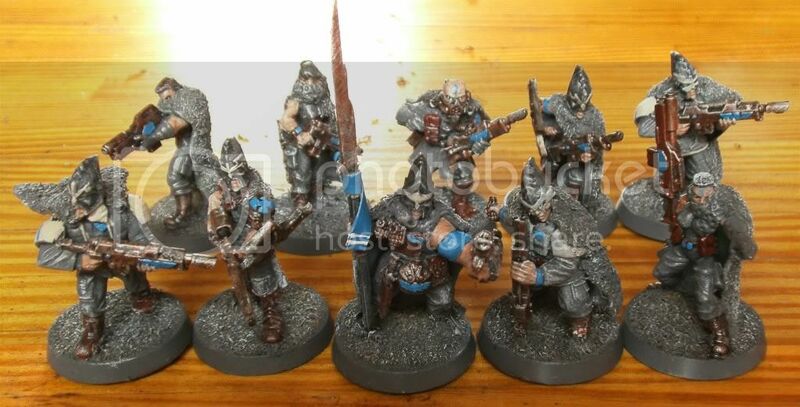 Looks interesting, but any chance of some close ups of individual units and models? Haha yeah... that'll do it! Nice work, when I have some breath room I'll read through it. Looking forward to it! 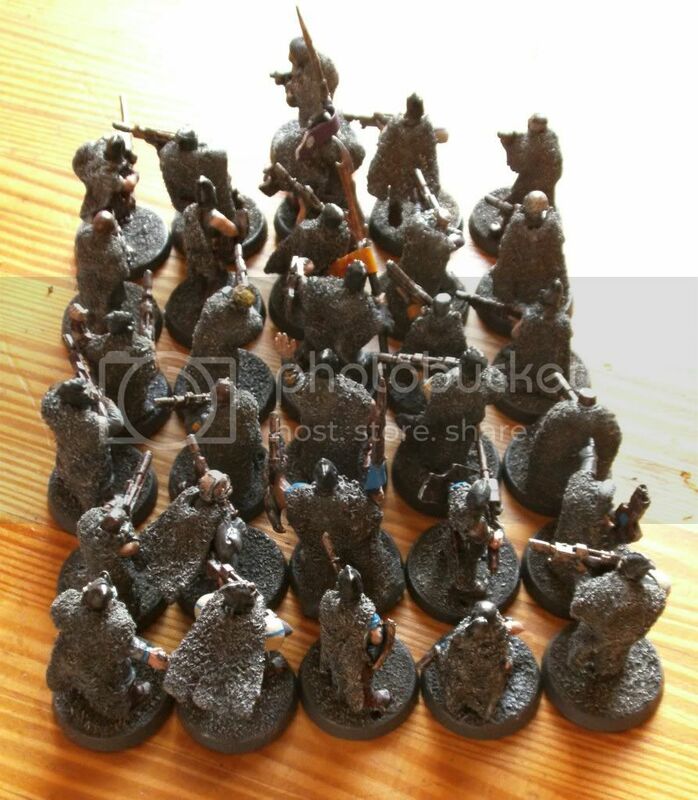 Dark Eldar heads on Cadian minis.... have no seen that before! That's awesome, it would make a great base for a unit of heavily armored Redemtourist types I think. Dark Elf, actually! I use them to depict ritualistic 'death masks', something these semi-tribals don before going on a war party. Last edited by Mare; 07-04-13 at 05:03 PM. A second wave of heavily converted reinforcements! Last edited by Mare; 07-06-13 at 06:01 PM. Definitely worth some rep. 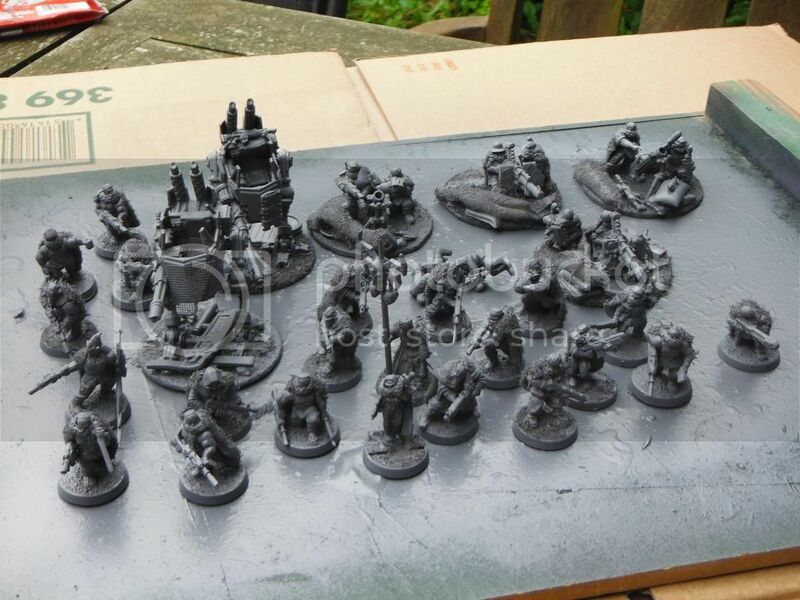 I'm seeing Necromunda models, cadians, valhallans(?) catachaans, and a few I can't identify. How did you make the cloaks?